These are the most popular and worth seeing destinations in Moldova. Most of the trips may be done in one day from Chisinau. More places can be visited and explored in one day provided you travel by car and plan your itenerary beforehand. I can also be your travel guide and companion, book your accommodation in Moldova and Transdniestr, rent you a car with/without the driver and make your stay in Moldova unforgetable. Chisinau is the capital of the Republic of Moldova, a very modern green and cozy town in the center of our country. The excursion includes visiting the historical center of Chisinau, administrative and cultural edifices on the main boulevard Stefan cel Mare, the main square of the General National Meeting, two central parks, churches and museums of the city, Central Market, market of souvenirs, W.W.II memorial. Cricova and Milestii Mici wine cellars are recognised to be the biggest underground wine cellars in Europe. The wine factory and wine collection are located in limestone tunnels and form an underground wine city with motor streets named after the popular wine brands - Cabernet, Shardonait, Feteasca, Sauvignon etc. You need a car to make this tour and an English speaking guide will be driving you through this underground wine town telling about the winery, wine production and their famous collections. The tour ends with a tasting of 3-5 types of collection and ordinary red and white wines and a lunch, if ordered. Excursions from 2 people. Should be booked in advance. Cojusna wine cellar is a smaller cellar in the close proximity of Chisinau town. It is located in the village Cojusna in Straseni district. Its factory is situated above the ground and its wine collection with 2 nice tasting rooms underground. They have very friendly and hospitable English speaking guides and can organise excursions for one person only. Should be booked in advance. No need of a car and the tour is a little cheaper. Orheiul Vechi is an ancient settlement situated in the left bank of the Raut river near the villages of Trebujeni and Butuceni in Orhei district (about 50 km northeast of Chisinau). In the Middle Ages, two medieval towns were set up here. 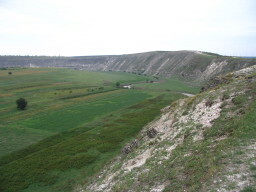 The first one Sehr-al-cedid (New Town) occupied almost the whole territory of the settlement (268 ha) belongs to the Golden Horde (XIVth century); the second one is the ancient Moldavian town of Orhei, which was established here in the XVth - XVIth centuries. Other vestiges discovered on the territory of the settlement : a mosque, two mausoleum, a caravan-seraglio and three bath houses. An orthodox cave monastery dated from XII century is still working nowadays and the English speaking monk will tell you some of its history. Down in Butuceni village is a small peasant house preserved from the XXth century and transformed into a museum. Soroca town is situated 160 km north of Chisinau on the western bank of the Dniestr river. In the medieval times it had a particular importance for the defense system of Moldova against the invasions of tartars, polyaks, Cossacks, ottomans and Slavs from the East. Nowadays it's a small Moldovan town on the Dniestr river bordering Ukraine and famous for its fortress, the largest Gipsy community in Moldova, sand stone rocks and the candle of gratitude up on a mountain that opens to a traveler a very nice view of the town and surroundings. 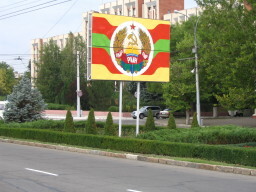 Transdniestr or Transnistria or Pridnestrovie is the name for the non-recognised Republic on the eastern bank of Dniestr river. Known by foreign travelers as the museum in the open-air of Communism and Soviet Union, with many Soviet relics on the main streets of its industrial towns and also for being a state that does not exist. 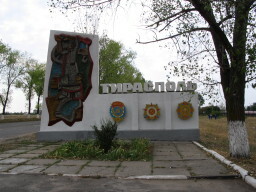 Tiraspol and Bender / Tighina towns are the 2 biggest in the Republic situated in the close proximity on different banks of the Dniestr river. Nice and cozy towns, second biggest after Chisinau. In the center of Tiraspol, one can see 2 monuments to the father of the communism Vladimir Lenin, streets with soviet names, House of Soviets, Memorial to 3 wars (W.W.II, Afghan war and Civil war), nice parks and boulevard. Bender town is a much older town, being even older than Chisinau. 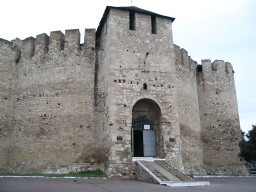 There is a Medieval fortress in the center of the town that is now served as the base of the Transdniestrian army. In XVIII century the Swedish king Carol has resided in Bender for 4 years asking support from Ottomans and trying to create an alliance against the Russians. The symbol of Carol, the Golden Lion, is still present on the flag of the town. During the Civil War in 1991-1992 Bender town and its citizens has suffered the most. The War Memorial in the center and the Administration building with bullet holes in it keeps the memory of those bloody days. Saharna monastery complex is situated in one of the most picturesque gorges on the western bank of the Dniestr river near Saharna village, 8 km away from the district center of Rezina, 14 km from the railway station of Ribnitza and at approximately 110 km to the North from Chisinau . The first settlements on the steep banks of the river of the same name were founded by the Gets and are dated to II century B.C. At that time also was erected an earth mound with three earth and one stone bastions and a ditch as well. Covered with forests, the Saharna river canyon as long as 16 km with a large number of more than 30 rapids and cascades will pleasantly surprise even a sophisticated traveler, who is looking for a comparable experience outside Moldova. The largest cascade falls down from a height of 10 meters and it is as wide as 5 meters. It is Moldovan Niagara Falls most impressive in Winter, Spring and Autumn after the rains. Way of transport : by public bus from the Central bus station in Chisinau or by a cab from Rezina town. 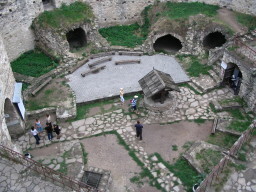 The monastic structure of Tipova is situated near the village of Tipova and is hewn in a rock of about 100 m height. 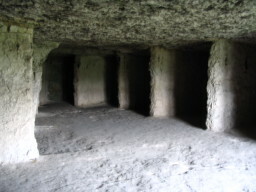 Built in the XVIth - XVIIth centuries, the cave monastery is a complex architectural ensemble consisting of numerous premises made in three levels.